Making a Low cost, simple and robust 6kW, 50HZ Pure Sine Wave, 48vdc to 230vac, INVERTER. 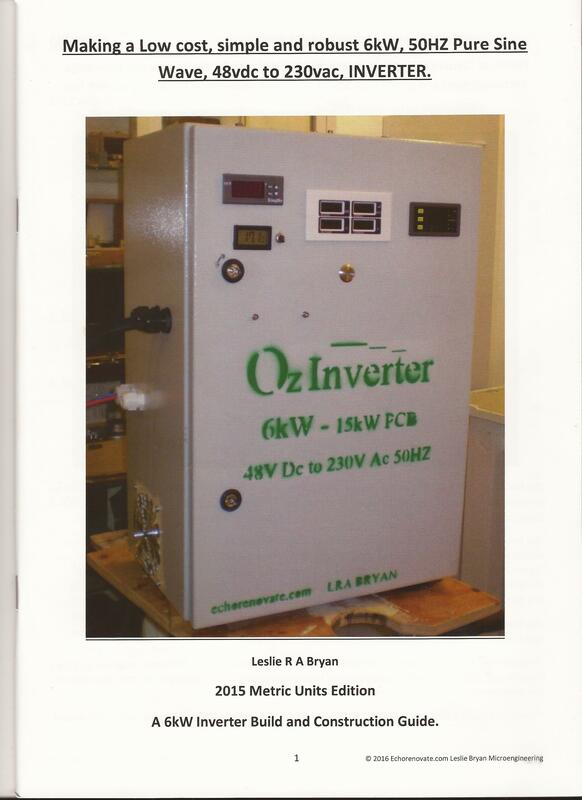 Those folk that have followed ‘Oztules’, wonderful endeavours will understand that for posterity and easy reference, and for my boys, I have put together a Book that gives the technical, describes and shows (lots of colour photos), the OzInverters I built and now run. There is no money in this book publication, we are not a commercial organization, we just want our costs and P+P, but it’s good to finally see all that Information is in one place, in a Book. March 2016, the original Power & Control board from the Chinese manufacturer PJ, (PowerJack) became difficult to obtain, along with questionable QC and some poor manufacturing. A New Power board was created to match the OzControl board that uses the 8010 chip. 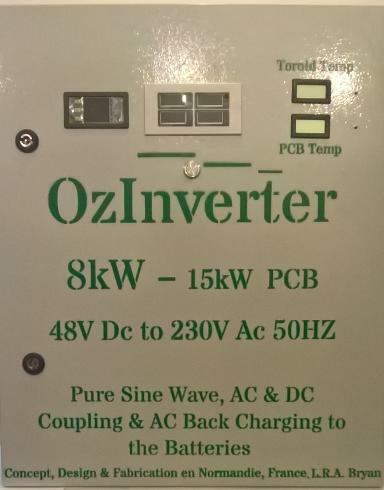 Extra time was taken on the design and construction of the PCB’s, so to ensure that all components and parts of the New OzInverter were easily obtainable. The Book. ISBN 9780993590306. A4 Size, 76 printed pages, 151 colour photographs, 14 diagrams. 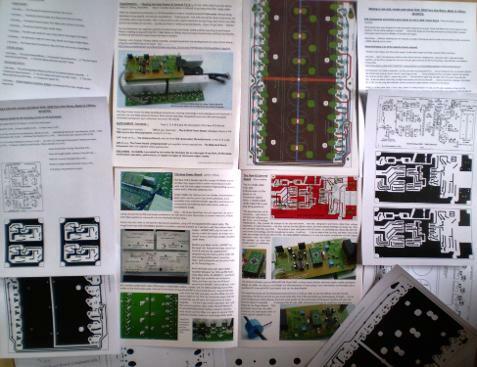 A4 size, 4 pages colour photographs and details of the PCB boards, and construction tips. 7off A4 size, loose leaf….. The 6-15kW Power Board, individual sheets of A4 PCB construction Masks/patterns, at real 1 to 1 size. 1off sheet of A4….. The OzControl Board, with all three PCB construction Masks/patterns, at real 1 to 1 size. 2off A4 size, ‘The Power Board Component List’ and suppliers where appropriate. ‘The OzControl Board Component List’ and suppliers where appropriate, and the OzCooling Board Masks and componets List. Everything, explaining & showing …. From the Core, winding the toroid, to the PCB’s and all the other necessary components to give you a Real Working 6kW OzInverter. A4 Size, 76 printed pages, 151 colour photographs, 14 diagrams. And a PCB Making Supplement containing 10 sheets of A4, etch masks for making the 3 PCB's, lists of parts and PCB construction tips. Price includes Postage & Packing, (please see below amendments). 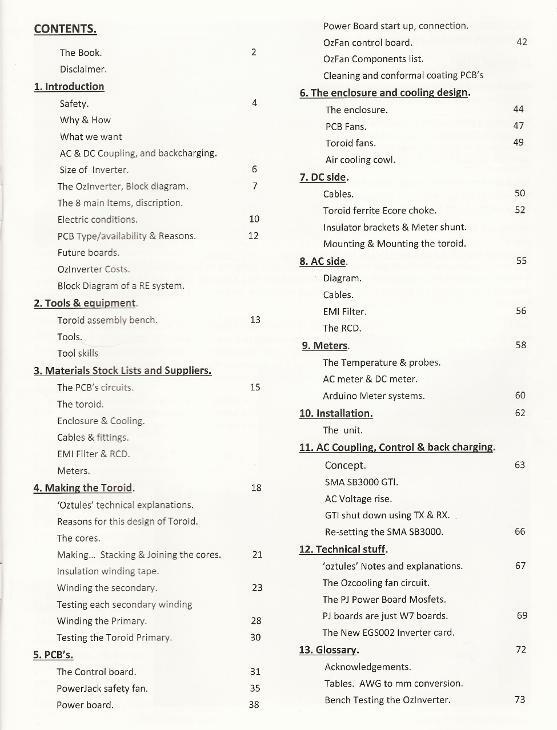 A4 Size, 76 printed pages, 151 colour photographs, 14 diagrams, and a PCB Making Supplement containing 10 sheets of A4 etch masks for making the 3 PCB's, lists of parts and PCB construction tips. And Also the 3 required commercially manufactured bare PCB’s, Power Board, OzControl Board, & OzCooling Board. (please note there may be a delay of 14 days from order for stocking the PCB’s ). June 2018, price rise to cover postage costs. Standard post and tracking is now approx. $24. to most normal places in the World. PLEASE Note .... Brazil does not recognize the international tracking number from my local French Post Office, and can be up to 12 weeks before delivery. I can not offer Tracking when posting to Brazil. If you wish to purchase more that one set of PCBs, please contact me here or PM me on the RE Forums. Clockmanfr. At present I am writing a second edition of the OzInverter book that will have the finalised designs and the final PCB designs. I will also include the real size copper etch masks within the new book. There is now ready for production a 60Hz and 120vac OzControl board PCB, please contact me for further details. 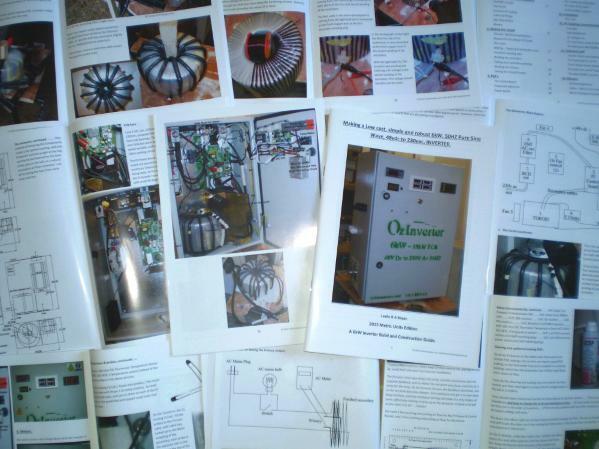 The 60Hz copper masks and the toroid build amendments for 120vac will be in the new book. The Future.... ........ Manufacturing OzInverters?.... At Present, No way! just far to many hurdles to jump through. But may get my boys to do a kit of parts, as another option with the Second edition of the OzInverter Book early 2019. 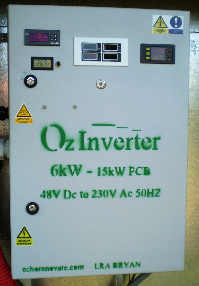 OzInverter project mantra........ KEEP IT SIMPLE, MAKE IT ROBUST, and very importantly. KEEP IT COST EFFECTIVE. If you recycle components and reuse toroid cores, a fully working 6kW OzInverter is possible at $380, using all new components approx. $650.